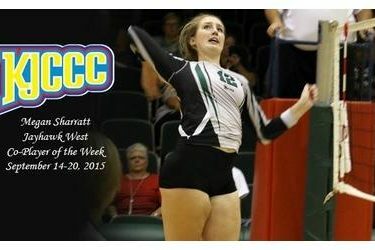 Leading the Lady Saints to a four win week, Seward County sophomore Megan Sharratt was named the Jayhawk West Co-Player of the Week by the league in a release Tuesday. Sharratt rose to the occasion in a big way for the Lady Saints this week, leading them to a quartet of wins including a five set victory over former #13 Western Wyoming. Monday against Garden City, Sharratt was unstoppable in the middle for Seward, finishing with 9 kills and 0 errors on 16 swings in a 3-0 Seward sweep. Friday she turned things up on the other side of the net, combining for 15 blocks in two Seward matches while also recording 22 kills against Laramie County and Western Wyoming. She finished the Wyo-Braska Shootout with 12 kills in a sweep of Central Wyoming, giving Seward their first winning weekend at the tournament since the 2008 season. It marks the second time that Sharratt has won Player of the Week honors, her first coming coincidentally almost exactly one year ago as a freshman. Seward has now had four different players honored with weekly awards by the conference after Alex Wood earned Player of the Week and Kimberly Diaz earned Defensive Player of the Week honors in week two and Viviane Viana was the Defensive Player of the Week in Week three. Sharratt and the Lady Saints will return home on Wednesday, taking on Cloud County in a big Jayhawk West Conference match in the Greenhouse starting at 6:30 pm.